Sulbana at the Ahlemer cheese-seminar 2017 | Sulbana AG – Käserei-, Hygiene- und Verpackungstechnik. 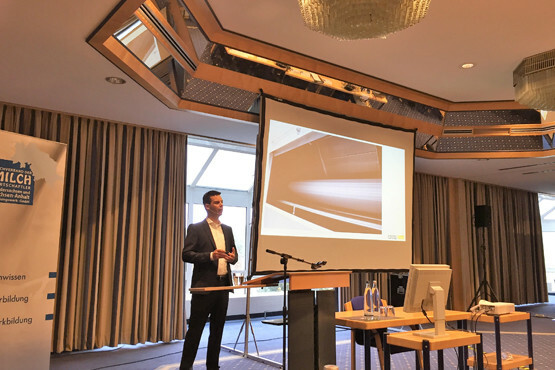 At the Ahlemer cheese-seminar, in Göttingen in the middle of September, Thorsten Kehl, Sulbana Group CEO, described several new approaches of the Sulbana group for the production of mozzarella and pizza cheese. With the presentation, divided into three sections (technique, technology and trends), more than 100 participants were given an insight into the latest developments and technologies in the pasta-filata production. We would like to thank the professional dairy association of Niedersachsen and Sachsen-Anhalt for the invitation to this year’s Ahlemer cheese-seminar.